A new survey of 14-15 year old girls in Northern Ireland has found they have adequate amounts of iodine in their bodies based on guidelines from the World Health Organisation (WHO). This is the finding from a new report commissioned by safefood and undertaken by Queen’s University Belfast titled “Iodine Status on the island of Ireland.” The report also found that higher intakes of dairy products were associated with better iodine status. 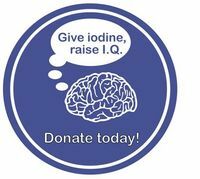 Principal investigator, Professor Jayne Woodside, Queen’s University Belfast [and IGN National Coordinator for Ireland] continued “We chose this population group because iodine is an essential nutrient and there were concerns this group weren’t getting enough from their daily diet.